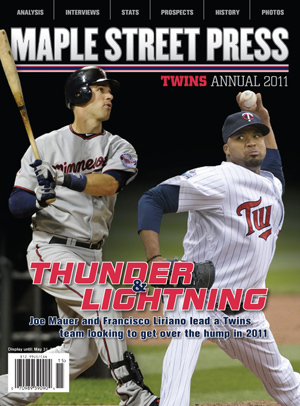 There isn’t much doubt that the 2011 Twins team is still missing some pieces. The trick is finding pieces that fit. Take middle infield. Nick wrote yesterday about how the Twins could use some additional depth, and that’s undoubtedly true. I’m excited to see if Alexi Casilla and Tsuyoshi Nishioka can become as good as we hope, and like Seth, I’m not anxious to block either of them so I can overpay Michael Young. But a safety net is in order, and there are some good ones – including one I can’t believe we haven’t heard more about. The most mentioned name, both locally and nationally, seems to be Orlando Cabrera. In many ways, he’s a perfect fit – veteran, winning track record, and he had a very positive impact while here less than two years ago. The problem? He wants to start. Unless he changes his mind, that’s a deal-breaker for either side. And even if Cabrera says it’s OK to not start, it isn’t clear the Twins would really trust him to maintain that stance. Let’s not forget that the year before he was with the Twins, Cabrera was criticized for being a negative clubhouse presence by the White Sox. Even if he says otherwise, it’s not clear that he’s ready to go gently into that good night. Another popular name is David Eckstein. Eckstein is 36 years old, hit .267 last year, got on-base at a below-average .321 clip, and has zero power. However, he’s decent defensively (though he played exclusively at second base the last two years) and known for his scrappy, veteran hustle. He’s basically an older Nick Punto – including his fun-sized height. He’s exactly the kind of player that Ron Gardenhire is likely lobbying to add to the team. Which is EXACTLY why I can’t believe the Twins would sign him. You don’t give a coke addict a vial of crack to store in the closet, and you don’t give Ron Gardenhire a veteran, scrappy, defensive-oriented shortstop to sit on the bench. Gardy will be able to add this to the list of non-moves he can be bitter about. How about Julio Lugo? The 35-year-old has always been a defensive specialist, which is the kindest term for a guy who can’t hit. That’s a tad overly harsh, considering he hit quite well with both Boston and the Cardinals in 2009. But last year with the Orioles he was dismal, hitting .249 with a sub-.300 OBP while filling various injuries. But so what if he didn’t hit much? He’s a decent fielder, and he’s not exactly ancient. If he’s not a clubhouse problem, he could be a good overall fit whose hitting will just make him more affordable. And finally, we get to the name I can’t believe is still out there. He’s played both shortstop and second base recently. He’s only 32 years old. He made $8M last year. He was traded at the deadline, at which point he had a .282/.327/.361 line. And most of all – he’s an ex-Twin All-Star. I’m talking, of course, about Cristian Guzman, who still hasn’t signed with anyone. He’s absolutely going to need to sign with someone as a utility player if he wants any chance to regain his starter status. The biggest problem might be that his defense has slipped from his time with the Twins, but it’s still not awful. I’m shocked that we aren’t hearing more about him considering the limited options the Twins have in-house. By most accounts, the Twins have stretched themselves pretty thin with payroll this year, so they might not have much to spend. And let’s not forget that Delmon Young’s arbitration case has not been decided yet, and there’s a $1.6M range between what he’s asking and the Twins are offering. But if the Twins do find some money underneath some couch cushions, there is no doubt the middle infield should be the priority. We’ll see which of these guys they think will be the best fitting puzzle piece. The Twins have depth in the middle infield with Tolbert and Trevor Plouffe at AAA. If they thought they needed more, they would have signed Nick Punto. I'm with TT. All this "Back to the Future" talk seems a little out of place. If the available candidates (Tolbert, Plouffe, Hughes) are simply dreadful during Spring Training, then you look at who's left out there and decide if you want to make them an offer. Considering the potentially over extended payroll now is not the time to pull a "Sidney Ponson" move on the middle infield. How about we double check the bullpen first. I think that is where we have to be most concerned about first. Unless we're guaranteed to have a solid bullpen (unlikely given the offsason losses) we should be focused there.